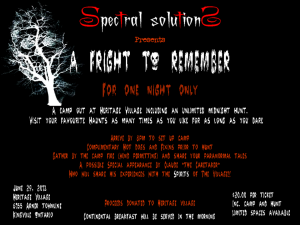 On Saturday June 25 2011, the Spectral Solutions team will be holding its first public hunt of the year. The price of tickets are $10 for adults and $5 for children for the Sunset walk. The Sunset Ghost Walk will be welcome to those who have younger children who wish to do a family event, but is not limited to just families. The Moon Light Ghost Walk is for adults only. We do ask everybody to dress accordingly to weather conditions, and encourage patrons to feel free to take photos, video, and audio recordings. As we will be requesting any possible evidence you have captured. Please show up 45-30 minutes early as we will have registration forms for you to fill out, and we would like to start on time. Click the poster to view larger image. On June 12 2010, the Spectral Solutions team held a public hunt at Heritage Village. When the team arrived we were greeted with eager, nervous and excited fans. The night was split into two hunts: the sunset hunt which was from 8pm-11pm and the moon light which was from 12am-3am. Our guests were divided into smaller teams and got to investigate 6 of the buildings with a different investigator at each location for both time frames. The buildings we were able to investigate this included The Train Station and Caboose, School House, Church, Police Station, Ross Cabin, and the Waggott House. Following the success of our June 12 Public Hunt, the team decided to organize another one once again at Heritage Village on October 23rd. The team received an overwhelming response and we were sold out in less than 12 hours. The team arrived and set up carved pumpkins at each location to set the mood for Halloween. Once again, the evening was split into two hunts: the sunset hunt from 8pm-11pm and the moonlight hunt from 12am-3am. This time we were able to investigate Jack Miners, The Train Station/Caboose, Ross Cabin, Holden House, General Store and the Waggott House. We were told that participants from our sunset hunt had some personal experiences. The evening ended at approximately 3:15. At that time, the team invited any willing guests to participate in a mass “dead time” at some of the active locations from the evening. We would like to thank Heritage Village, as well as all those who attended our public hunts this year. Shannon Tracey-Boggess: Hi Gang! Thanks for an awesome night Saturday! My boys loved it…we are still talking about it. Thanks again for an incredible night! On September 26, 2009, Spectral Solutions held a public hunt. We arrived and were greeted with many happy and excited faces. We were able to meet and talk ghosts as well as some of our experiences with the attendees, most wanting to know stories of the Derelict Chapel as well as from the investigation the night before. After a short introduction of the team members, we went over the rules and broke up into 3 groups. We started at St. Johns cemetery and investigated for rougly over an hour. We pressed on, seperating the groups, with two heading to our favourite cemetery, St. John the Baptist, and one heading over to Texas Road. After some time, the groups switched locations and investigated further. While investigating, the group was able to break up into smaller groups and get to know some of the public on a more personal level. We were also able to share personal experiences with the paranormal. The hunt ended around 1AM and fun was had by all. We were able to capture some interesting picture, but were unable to capture any audio. We would like to thank all who attended our public hunt. Stay tuned for future public hunts.